Brightly colored fiery red and orange new growth emerges in spring followed by graceful racemes of white flowers. 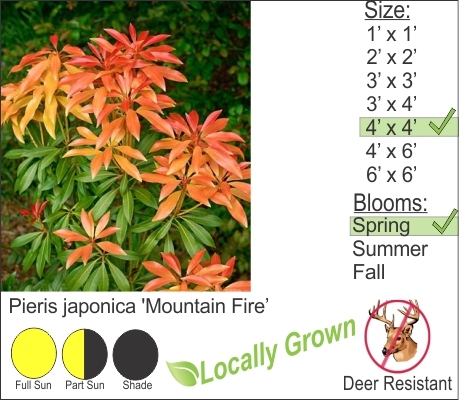 Mountain Fire is sure to be focal point in your landscape. This deer resistant shrub can handle shady locations. Be sure to provide adequate supplemental watering if you are planting near or under mature trees. This goes for all other shade loving shrubs and perennials.